You know this place by now, right?! Becoming intimate with it, Ginnie...and, that is not a bad thing! Ginnie Hart: As long as no one gets bored, Ray....! I never get bored by this place. Every time it is different. I love this view and the draw bridge pulled up. Great picture. Ginnie Hart: I know you and I will never tire of this place, MLMA. 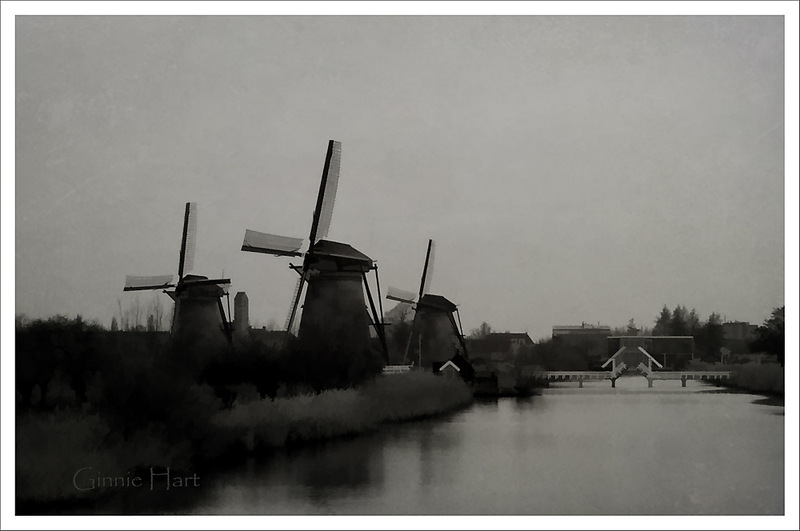 For one thing, with 19 windmills, there are so many photo-comp possibilities. Ginnie Hart: Thanks, Elaine and yes, I know you are not that fond of Boat Friday. Every time I have a windmill, I put it up just for you. The more I see this place, the more I enjoy it Ginnie! Ginnie Hart: You'd love it in real life, Richard, especially because it's so peaceful. Ginnie Hart: It was, Chris. Very. Ginnie Hart: You'd love it, JP, if you ever have a chance to see it. Ginnie Hart: You know me well, Lisl. Did we ever tell you that our wish is to have our ashes tossed out here when that day come? Oh I think we had some snow in Scotland too, but nothing in London. Guess what, I saw this on BBC yesterday! Ginnie Hart: We've seen the news about parts of the Netherlands having what Astrid calls black ice...but not yet where we live. It still hasn't gotten down to freezing, though this week it should, at night. Maybe I'll have my own video to share. Wonderful photo, parfect bw! i like it! Ginnie Hart: Thank you most kindly, Roland. Wrong Ginnie, I know this place. Love the softness of those sails. Ginnie Hart: We'll have to take you there, Chad, if you'd like. You'd be gobsmacked. This reminds me of a charcoal drawing, a well done one. Ginnie Hart: My g'ma used to do charcoal drawings, Mary, so that sounds good. Even in low light, it is beautiful !! Ginnie Hart: Thank you, Pat. It was very early morning! What a nice shot, Ginnie. That is a very stylish bridge. Ginnie Hart: Thanks, Frank. I never tire of this place! Yes, I'm being to recognise the view and can enjoy it in any weather conditions. A grey day? Ginnie Hart: It was early Christmas morning, Alan, without a sunrise to speak of...so, yes, a grey sort of day. Ginnie Hart: LOL, Louis. You've already been way too generous! Ginnie Hart: Don't ever say NEVER, Brian. You just never know! Ginnie Hart: I LOVE the mills! Merci. Thought it looked familiar, Ginnie! That is a nice moody shot. Ginnie Hart: Thanks, Michael. Sometimes I really like moody. Ginnie Hart: With 19 windmills in one spot, Peter, the combinations are almost endless! Thanks. Ginnie Hart: Thank you, Cherry. It's a wee bridge that goes to the one mill open to the public during the week. Beautiful with this soft B&W treatment, Ginnie!! If it's windmills, can Ginnie be far behind...? Ginnie Hart: HA! Very true, Larry! You know me well.